Ireland's Blue Book is a romantic collection of Irish Country House Hotels, Manor Houses, Castles and Restaurants. Located throughout the island of Ireland, these charming and stylish hideaways are the perfect choice for your holiday vacation in Ireland. 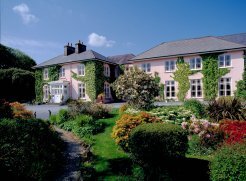 Ireland's Blue Book Hotels are also ideal for midweek or weekend breaks and for those seeking a romantic getaway or relaxing escape. With a choice of elegant Georgian Manors, Stately Castles, Historic Hotels, cosy Bed and Breakfast accommodation, Luxury Boutique Hotels and Designer Lodges, there is something to suit everyone's tastes and requirements. Also included in the collection are three of Dublin city's finest Michelin star restaurants. Ireland's Blue Book is the sole Irish representative association of Europe's leading heritage accommodation provider - Historic Hotels of Europe.